Pineapple stitch and laceweight cotton yarn are the perfect combination for a summer project. I just can’t get enough of the pineapple stitch in the summertime! The stitch is open and airy and it is so much fun to create. If you love this stitch as much as I do, check out our cover project from Interweave Crochet Summer 2018: the Yesteryear Top! 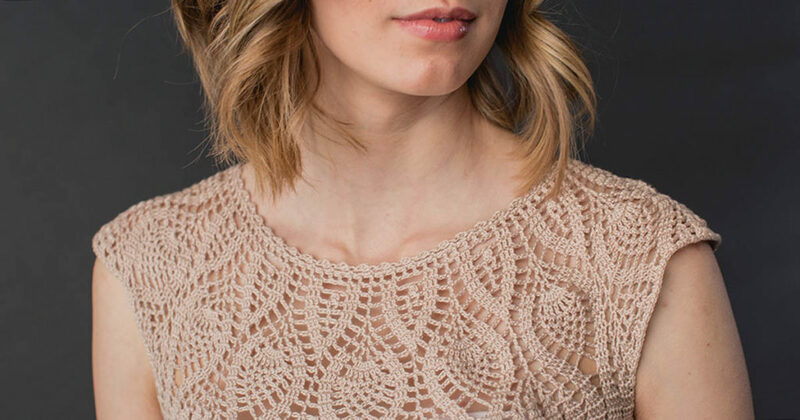 The Yesteryear Top was designed by Mimi Alelis, who is also the creator of the Limpet Lace Top, a favorite project from Summer 2016. If you enjoyed the Limpet Lace Top’s beautiful pineapple stitches, you’ll want to start on this project ASAP (I started stitching it before we even sent the issue to press). The Yesteryear Top features a lace design adapted from a vintage collar that’s been transformed into a light top. It is worked from top to bottom with a circular yoke. 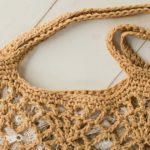 Unlike the Limpet Lace Top, it has a loose fit and is styled as a crop top, but the length is easily adjustable; just add more rounds to the bottom if you’d prefer a longer top. I love tops that are easy to alter to accommodate my long torso, and this one has been so easy to fit to my unique body shape. This top works up relatively quickly for a lace project. The breathable cotton yarn is easy to work with in the summertime and even easier to wear once finished. And with so many color options for Size 10 crochet thread, you might want to make one in every color. Start stitching the Yesteryear Top and let us know what you think! FINISHED SIZE 34 (38¾, 41¼, 46, 51)” bust circumference. Sample shown measures 34″, modeled with 2″ positive ease. YARN Nazli Gelin Garden 10 (distributed by Universal Yarn) (100% mercerized Egyptian Giza cotton; 306 yd [280 m]/1.76 oz [50 g]): #700-08 (natural), 3 (3, 4, 5, 6) balls. size if necessary to obtain correct gauge. GAUGE 33 sts and 18 rows = 4″ in (4 dc, ch 1) or (4 dc, ch 2) body patt. Grab some pineapple-stitch paradise . . .